The M249 is a light machine gun featured in Grand Theft Auto: Vice City Stories (where it replaces the M60 from GTA Vice City), The Ballad of Gay Tony, and GTA V. It is based on the real life M249 SAW. Victor Vance with an M249. In GTA Vice City Stories, the weapon is a powerful, one shot kill gun that holds 100 rounds per magazine, but is slightly less effective than the Minigun. Unlike the M60 from GTA Vice City and GTA Liberty City Stories, the M249 has a unique firing and reloading animation, no longer copied from the assault rifle animation. The M249 is a weapon of choice for several Rampages and is featured during "Farewell to Arms"
The M249 in The Ballad of Gay Tony (referred to as the Advanced MG) is the first hand-held machine gun to be featured in the HD Universe. The weapon is placed in the Assault Rifle slot, unlike in GTA Vice City Stories where the M249 would occupy the Heavy Weapons slot. The Advanced MG has a high rate of fire, making it well suited for engaging multiple enemies; however, it has less stopping power than the Assault and Carbine Rifles and is less accurate due to the weapon being fired from the hip rather than the shoulder, making headshots more difficult. The weapon's belt-fed design is a double-edged sword: it has a 200-round capacity but takes longer to reload. Against vehicles, the Advanced MG requires sustained fire to the engine or fuel tank to destroy it, unlike machine guns from previous games, which can destroy vehicles in just a few rounds, regardless of where the shots actually land on the vehicle. It is first given to Luis in the mission Going Deep for Ray Bulgarin. Additionally, law enforcement use the Advanced MG instead of the Carbine Rifle when firing upon the player from a helicopter. The M249 in GTA V, called the "Combat MG" in-game, is a hybrid design featuring the buttstock assembly of the M60 and the railed handguard of the MK46 Mod 0, a shorter and lighter version of the M249 designed for US Special Operations Forces. Weapon mods include an extended magazine (increasing ammunition capacity from 100 to 200 rounds), an angled foregrip (Magpul AFG2) that gives added stability and a slight increase in accuracy, a scope (ELCAN SpecterDR), and various color tints. GTA Vice City Stories features the M249E1 version, while the one featured in TBOGT is the M249E2 version. 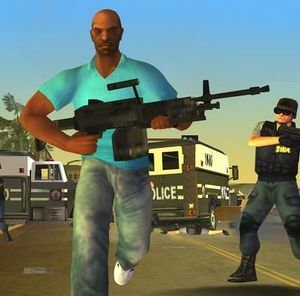 The M249E2 SAW was originally included in Grand Theft Auto : San Andreas, the files of this can be found in the PS2 version. The Advanced MG will spawn in Deathmatch when weapons are set to "Snipers." There is a dark green skull on the ammo box in TBOGT. The fact that Luis fires from the hip rather than the shoulder could mean Luis is inexperienced with the M249. At the InterGlobal Films studio in the first studio directly northwest of the entrance. Spawns at each safehouse after shooting all 99 red balloons. Given to the player in Going Deep. Available from Armando's gun van after said mission for $7,550, plus $400 for each additional ammo belt. Spawns in Safehouse after completing 20 Drug Wars and completing Going Deep.